My family has been traveling back and worth to Wildwood in New Jersey for over 25+ years. We absolutely LOVE the area and plan on moving there full-time after retirement. It's something we have planned for and look forward to doing in just a few short years!!! 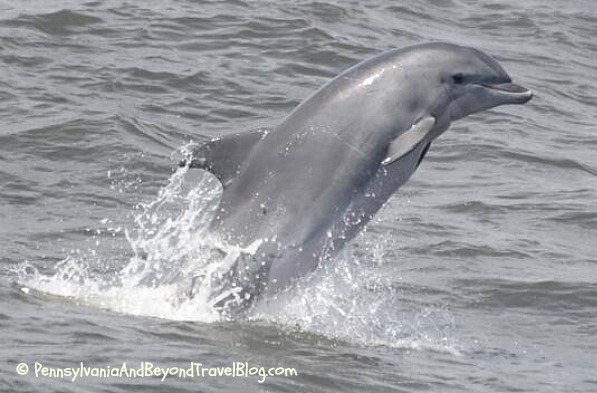 I am often asked by tourists where is the perfect place in Wildwood to watch and see dolphins? I am not talking about paying money and going out on a boat for a dolphin and whale watching cruise. Nope! I am talking about sitting or standing on the beach and clearly seeing dolphins out in the water. In my honest opinion and from past and current experience...the best place for dolphin watching in Wildwood happens to be up in North Wildwood behind the Hereford Inlet Lighthouse. You will want to drive up there on John F. Kennedy Avenue and take it to the corner where you see a bunch of benches (see photo above) and park along the street (paid metered parking). You will find several benches at that corner and several more that run along the beach front area that you can sit on. Personally though, the corner (shown in above photo) is the BEST sitting spot on the entire Wildwood island to dolphin watch! In addition, some times during the day are better than other times. We often sit there and see them between 7-9 AM and 4-7 PM in the evening. You can see them at other times...but for some reason, we see the bulk of them during those specific times May through early October every year. If the surfers are in the water near the corner or if swimmers are nearby...it typically chases the dolphins further out...so those are NOT good times to be sitting there and looking for the dolphins. Every time we go down to Wildwood (few times every year) we like to hang out on that corner and almost ever time...we get to see a school of dolphins swimming by. You do have to look close and I do recommend that you bring along a pair of binoculars, but you can definitely find them if you spend a little bit of time up there on the corner. You can get lucky on other areas of the island but in my honest opinion & from experience, that is definitely the place to see them if you don't want to pay for a dolphin and/or whale watching cruise! Enjoy and good luck! As someone who has been going to Wildwood for 25+ years I am sure that you are correct. So if I am able to go there I shall make sure to follow,your directions in order to see the Dolphins.